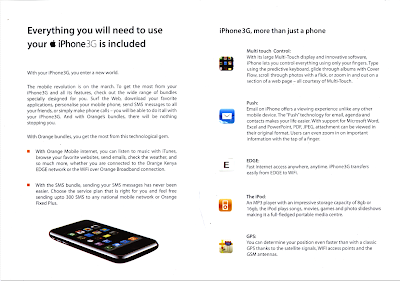 After visiting the Orange/Telkom Kenya stand at the Communication Commission of Kenya (CCK) expo, I was finally able to grab my hands on the elusive full pricing brochure of the iPhone 3G in Kenya. Sadly, the Orange staff did not have an idea of what the iPhone 3Gs is; but they were quick to admit this rather than telling you there is no such thing as most tech people in the country usually do. Here is the lowdown. From the above pricing, Orange iphone price plans give you 18 minutes of talk time and 10 sms per day.Let us compare this with other providers. 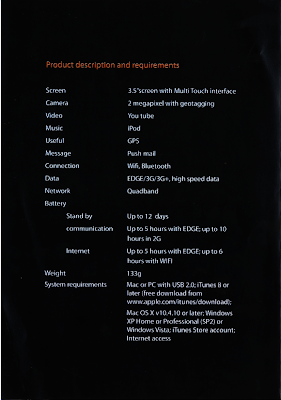 As we see from the above comparison , the total ownership cost for an iphone ranges from Ksh. 69, 000 for the 6 month 8 Gb prepaid version to 149,000 for a 2 year postpaid contract on the 16Gb iphone. After expiry of your contract, your iphone still remains locked to Orange Kenya and you may then move to their other plans. At Ksh. 5000 monthly, the iphone plan is quite a bargain, as long as your communication needs do not exceed the plan; extra consumption is charged upto kshs. 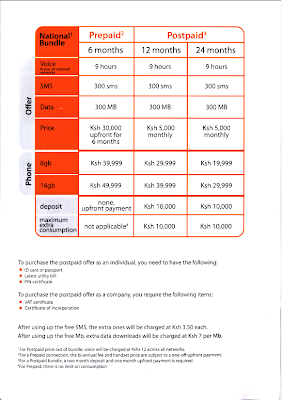 10,000(extended monthly plan), and kshs 7 per MB and Kshs 12 per minute for pay as you go. the closest rival to this is Yu which comes at Kshs. 700 more, considering cross network charges. 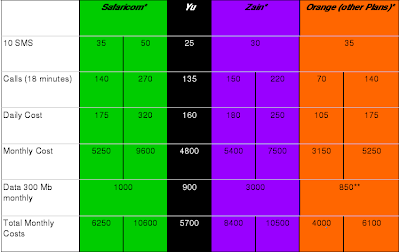 the only intra-network plan that beats both the iphone and Yu plans is from Orange again. From the above statistics, getting the iphone 3G with a 24 month plan is quite a bargain, rather the bargain for a smartphone like the iphone.